See another side of Hanoi with a day cycling trip that takes you away from the busy chaos of Hanoi’s city center and into the nearby countryside. Observe local life as you cycle through villages and along the banks of the Red River. 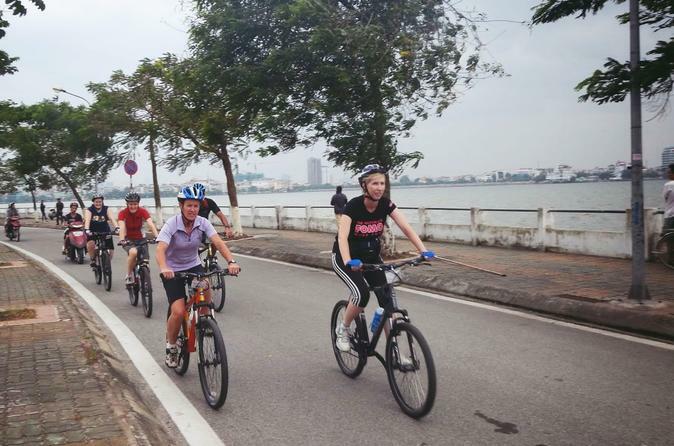 Before finishing the active day, we cycling around the West Lake, enjoy local Vietnamese food, sip a cup of coffee and admire the lakeside views before pedaling back to your hotel. Sample delicious Vietnamese cuisine just like the locals do — on the street. Try some awesome local foods not found in Hanoi Old Quarter. 8:30 Meet up at your hotel. After a short briefing about the bike, gears, and the biking trail, you will begin your adventure by pedaling from your hotel to the other side of the Red River. We will ride through Long Bien Bridge, the first steel bridge spanning the Red River in Hanoi, built by the French (French architect Gustave Eiffel, 1899-1902) and named after Paul Doumer (Governor General of French Indochina). Continue cycling and crossing the countryside of the Red River delta, a good chance for taking nice photos and witness the rural daily activities on the farm. 9:30 Visiting a family on the island in the middle of Red river. You can see the vegetable and banana, longan fruit…growing on this island. This island is like a different world compare to a busy city of Hanoi. People here are working hard and doing farm job by the old technology and by hand. Visit a host house, chat with them and going around to see the real rural daily life. 10:00 Ride back to the city and bike through a small market in the alley where the local people here shop their food every day. Many of the vegetable in this market come from the island that you just ride through. 10:30 Biking around the West Lake, the largest lake in Hanoi with a circumference of 18 km. The shore of this lake is lined with many local favorite sites such as unique coffee shops, religious monuments and delicious food stalls. We will taste different dishes here like Banh Cuon (steamed rice paper rolling minced pork and mushroom), Bun cha (grilled pork and rice noodle), Pho Cuon (steamed rice paper rolling with beef and vegetable. Your expert English-speaking local guide will give you an insight into the intricacies and traditions of Vietnamese food culture including details on ingredients and historical backgrounds of popular northern dishes. This unique private bike & food tour takes you to “off-the-beaten-path’. It is an opportunity to explore an especially lovely part of Hanoi — West Lake, the city’s largest freshwater lake and the traditional Old Chau Long food market. 13:00 Bike back to where we start and finish the ride here. 13:30 End Hanoi bike and street food tour. Ultimate Odyssey would love to meet you again!